SuSE Linux, one of the oldest Linux distribution was originally developed by a German company. Not many people will know that SuSE is an acronym in the German language for "Software und System-Entwicklung" which translates as software and system development. Over time, SuSE has gained a reputation as a robust, secure and easy to use Linux distribution both on the server and desktop front. 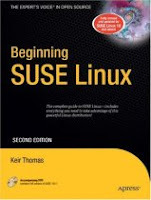 The book "Beginning SuSE Linux" is authored by Kier Thomas and published by APress. As the name of the book indicates, it is geared towards beginners in GNU/Linux who have set their eyes on trying out the SuSE Linux distribution. The book is divided into 7 different parts with the first part of the book discussing the pros and cons of using Linux as a part of ones daily routine. In this part, the author gives a well balanced view of what Linux is all about and the history behind its formation. The second part of this book contain chapters which hand hold a person in installing SuSE Linux on ones machine. The author starts by explaining the concept of partitions, backing up your data and the benefits of dual booting between diverse OSes. The 5th chapter titled "Installing SUSE Linux" gives a thorough introduction to installing this Linux distribution on ones machine. And the steps are accompanied by screen-shots which makes it rather intuitive to follow. SuSE provides a number of installation modes and one gets to know the best way of installing it. One thing worth noting is that SuSE allows the user to shrink his Windows partition from within its Installer and this book explains it in a clear way in the section on partitioning the disk. In fact the manner in which the author has explained the steps leaves no room for doubts while installing SuSE. The succeeding chapter lists the possible problems one might face and the solutions for these problems. Most Linux users would be aware of one or more of these problems but to a new Linux user, these could be a real time saver and will save their sanity when they face these problems. Part 3 of this book is titled "The No-Nonsense getting started guide" and has a collection of 6 chapters. These chapters give a good introduction to the SuSE Desktop - more specifically to the Gnome desktop which is the default one in SuSE. In the 8th chapter titled "Getting everything up and running", the author explains how to setup and configure the diverse hardware which form a part and parcel of a computer. For instance, this chapter deals with configuring the sound card, setting up and managing the printer including a printer on the network which is connected to a Windows machine, importing photos from a digital camera and more. But what is worth noting is that SuSE has its own unique methods and GUI tools to accomplish these tasks and the author explains these via the SuSE specific tools where ever applicable. There is a separate chapter on securing the machine running SuSE Linux where the author impresses upon the readers the necessity of securing ones machine. He further goes on to explain the different ways of securing SuSE which includes steps to update the software. This chapter also dwells deeply on using Aparmor - SUSE's industrial grade security system. It is really thoughtful of the author to include a chapter detailing the various commonly used Windows software and their possible Free replacements. The 4th part of the book titled "Shell and beyond" comprises of 5 chapters deals with educating the new Linux user on the usage of command line to accomplish ones tasks. The author starts by providing a gentle introduction to the shell, the different terminals available in Linux and then gradually moves on to explain the usage of different commands which provide the true power to Linux. In the chapter titled "Understanding Linux files and users", he gives a detailed explanation of the concept of files, their permissions and how they relate in the Linux as well as explain the concept of mounting. Even though I was conversant with most of what the author was explaining, reading the book, I couldn't help feel that this book is an excellent resource for a Linux neophyte who is looking forward to taking his first baby steps in learning to be productive in Linux, more specifically SuSE Linux. The next three chapters deal with getting SuSE Linux to play all the proprietary music and video file formats. One of the inherent disadvantages of Linux owed mostly due to the ideological stance of GPL is that it cannot play music and video encoded in a proprietary file format out of the box. But with a little effort, it is possible to provide support for these proprietary file formats in Linux. In these chapters, the author gives a good run down on the various music and video codecs and ways of getting support for them in SuSE Linux. He introduces different software which allow one to not only just play music but also to categorize, burn music onto removable media and even rip music from audio CDs and save them on to ones hard disk. Surprisingly, I found this book much more than a mere how-to-do-it sort of book as the author provides details of related facts from a lay man's perspective where ever applicable. For instance, in the chapter titled "Movies and Multimedia", while explaining how to enable media players to play the files encoded in these formats, he impresses upon the readers the ethical issues surrounding the DRM and patents. There is a whole chapter dedicated to image manipulation where many features of the GIMP software has been explained. The author has done a splendid job of explaining this image manipulation editor within the constrains of this chapter. The next 8 chapters deal with using SuSE in an office setup. SuSE Linux comes bundled with a plethora of applications which form a part and parcel of any office setup. This includes word processors, spreadsheets, a database, presentation software and email client just to name a few of them. This book has dedicated a chapter each in explaining how to put these software to productive use in an office setup. Catering to those die hard MS Word enthusiasts, there is also a chapter on making MS Office to work natively in SuSE Linux if at all you have a licensed copy of it lying around. The seventh and final part of the book titled "Keeping your System Running" provides details on the vagaries of system administration such as installing, removing and updating software binaries, compiling software from source and installing it, managing users and groups optimizing your system, backing up data and scheduling tasks. The final chapter which is the 34th chapter of this book deals with explaining various ways of connecting to the SuSE Linux machine remotely where the author explains about SSH and related tools. This book contain three appendices with a glossary of Linux terms being one of them where the newbies among us gets to understand the meaning of Linux related geek terms. There is also an appendix containing a Bash command index which - embracing authors own words - provides a whistle stop tour of commands that can be used at the Bash Shell. Rating : A comprehensive book, ideal for newbies who wish to learn to be well versed in installing and using SuSE Linux. I have always maintained that writing a good book is an art. It is not just enough if the person is well versed in his area of expertise. Rather, he should also be a good communicator and should be able to sustain the reader's interest in the subject through out the book. Kier Thomas shines through in his narration of the concepts quite well. He explains in a simple, lucid and entertaining way different ways of configuring things in SuSE Linux from a users perspective. This is definitely a good book for those of us who look forward to installing and becoming productive in using SuSE Linux. I've been using OpenSUSE 10.2 since the time it came out. I must say, it's one of the most stable Linux distros out there. I'm running KDE on XGL with Beryl and I've yet to see a crash. Also the speed and responsiveness of the OS is awesome. A great book. I bought it from Amazon for a ridiculously cheap price ($20 dollars odd) and found it a perfect aid to my first steps into Linux from Windows. The book has a wonderfully detailed index so you can use it to look up specific issues, or just read it like a novel. It strikes just the right middle ground between novice and nerd. It never insults your intelligence like those "dummies" books, but is never too complex for a Linux newbie. Thanks Keir Thomas.